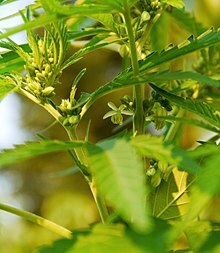 Cannabis sativa is an annual herbaceous flowering plant indigenous to eastern Asia but now of cosmopolitan distribution due to widespread cultivation. It has been cultivated throughout recorded history, used as a source of industrial fiber, seed oil, food, recreation, religious and spiritual moods and medicine. Each part of the plant is harvested differently, depending on the purpose of its use. The species was first classified by Carl Linnaeus in 1753. The word “sativa” means things that are cultivated. The flowers of Cannabis sativa are unisexual and plants are most often either male or female. It is a short-day flowering plant, with staminate (male) plants usually taller and less robust than pistillate (female or male) plants The flowers of the female plant are arranged in racemes and can produce hundreds of seeds. Male plants shed their pollen and die several weeks prior to seed ripening on the female plants. Under typical conditions with a light period of 12 to 14 hours both sexes are produced in equal numbers because of heritable X and Y chromosomes. Although genetic factors dispose a plant to become male or female, environmental factors including the diurnal light cycle can alter sexual expression. Naturally occurring monoecious plants, with both male and female parts, are either sterile or fertile but artificially induced “hermaphrodites” can have fully functional reproductive organs. “Feminized” seed sold by many commercial seed suppliers are derived from artificially “hermaphrodytic” females that lack the male gene, or by treating the plants with hormones or silver thiosulfate. Although the main psychoactive constituent of Cannabis is tetrahydrocannabinol (THC), the plant is known to contain more than 500 compounds, among them at least 113 cannabinoids; however, most of these “minor” cannabinoids are only produced in trace amounts. Besides THC, another cannabinoid produced in high concentrations by some plants is cannabidiol (CBD), which is not psychoactive but has recently been shown to block the effect of THC in the nervous system. Differences in the chemical composition of Cannabis varieties may produce different effects in humans. Synthetic THC, called dronabinol, does not contain cannabidiol (CBD), cannabinol (CBN), or other cannabinoids, which is one reason why its pharmacological effects may differ significantly from those of natural Cannabis preparations. Beside cannabinoids, Cannabis chemical constituents include about 120 compounds responsible for its characteristic aroma. These are mainly volatile terpenes and sesquiterpenes. Human intervention has produced variation within the species and some authorities only recognize one species in the genus that has had divergent selective pressure to either produce plants with more fiber or plants with greater THC content. 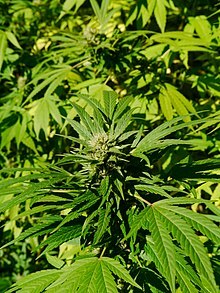 Large variability exists within either species, and there is an expanding discussion whether the existing paradigm used to differentiate species adequately represents the variability found within the genus Cannabis. There are five chemotaxonomic types of Cannabis: one with high levels of THC, one which is more fibrous and has higher levels of CBD, one that is an intermediate between the two, another one with high levels of cannabigerol (CBG), and the last one almost without cannabinoids. Cannabis strains with relatively high CBD:THC ratios are less likely to induce anxiety than vice versa. This may be due to CBD’s antagonistic effects at the cannabinoid receptors, compared to THC’s partial agonist effect. CBD is also a 5-HT1A receptor (serotonin) agonist, which may also contribute to an anxiolytic-content effect. The effects of sativa are well known for its cerebral high, while indica is well known for its sedative effects which some prefer for night time use. Both types are used as medical cannabis. Indica plants are normally shorter and stockier than sativas. Indicas have broader, deeply serrated leaves and a compact and dense flower cluster. 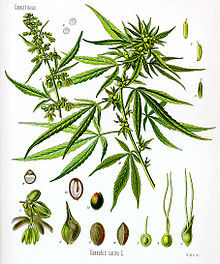 Cannabis sativa seeds are chiefly used to make hempseed oil which can be used for cooking, lamps, lacquers, or paints. They can also be used as caged-bird feed, as they provide a wonderful source of nutrients for most animals. The flowers (and to a lesser extent the leaves, stems, and seeds) contain psychoactive chemical compounds known as cannabinoids that are consumed for recreational, medicinal, and spiritual purposes. When so used, preparations of flowers (called marijuana) and leaves and preparations derived from resinous extract (e.g., hashish) are consumed by smoking, vaporising, and oral ingestion. Historically, tinctures, teas, and ointments have also been common preparations. In traditional medicine of India in particular C. sativa has been used as hallucinogenic, hypnotic, sedative, analgesic, and anti-inflammatory agent. A Cannabis plant in the vegetative growth phase of its life requires more than 12–13 hours of light per day to stay vegetative. Flowering usually occurs when darkness equals at least 12 hours per day[dubious – discuss]. The flowering cycle can last anywhere between nine and fifteen weeks, depending on the strain and environmental conditions. In soil, the optimum pH for the plant is 6.3 to 6.8. In hydroponic growing, the nutrient solution is best at 5.2 to 5.8, making Cannabis well-suited to hydroponics because this pH range is hostile to most bacteria and fungi. Tissue culture multiplication has become important in producing medically important clones, while seed production remains the generally preferred means of multiplication. Cultivars primarily cultivated for their fibre, characterised by long stems and little branching. Cultivars grown for seed which can be eaten entirely raw or from which hemp oil is extracted. Cultivars grown for medicinal or recreational purposes. A nominal if not legal distinction is often made between industrial hemp, with concentrations of psychoactive compounds far too low to be useful for that purpose, and marijuana. ^ Mary-Lou E. Florian; Dale Paul Kronkright; Ruth E. Norton (21 March 1991). The Conservation of Artifacts Made from Plant Materials. Getty Publications. pp. 49–. ISBN 978-0-89236-160-1. ^ SHARMA (2011). PLANT TAXONOMY 2E. Tata McGraw-Hill Education. pp. 459–. ISBN 978-1-259-08137-8. ^ Robert Clarke; Mark Merlin (1 September 2013). Cannabis: Evolution and Ethnobotany. University of California Press. pp. 16–. ISBN 978-0-520-95457-1. ^ Schaffner, John H. (1921-01-01). “Influence of Environment on Sexual Expression in Hemp”. Botanical Gazette. 71 (3): 197–219. doi:10.1086/332818. JSTOR 2469863. ^ Aizpurua-Olaizola, Oier; Soydaner, Umut; Öztürk, Ekin; Schibano, Daniele; Simsir, Yilmaz; Navarro, Patricia; Etxebarria, Nestor; Usobiaga, Aresatz (2016-02-02). “Evolution of the Cannabinoid and Terpene Content during the Growth ofCannabis sativaPlants from Different Chemotypes”. Journal of Natural Products. 79 (2): 324–331. doi:10.1021/acs.jnatprod.5b00949. PMID 26836472. ^ Russo, Ethan B (2011-08-01). “Taming THC: potential cannabis synergy and phytocannabinoid-terpenoid entourage effects”. British Journal of Pharmacology. 163 (7): 1344–1364. doi:10.1111/j.1476-5381.2011.01238.x. ISSN 1476-5381. PMC 3165946. PMID 21749363. ^ a b c d e f g h i Novak J, Zitterl-Eglseer K, Deans SG, Franz CM (2001). “Essential oils of different cultivars of Cannabis sativa L. and their antimicrobial activity”. Flavour and Fragrance Journal. 16 (4): 259–262. doi:10.1002/ffj.993. ^ a b Suman Chandra; Hemant Lata; Mahmoud A. ElSohly (23 May 2017). Cannabis sativa L. – Botany and Biotechnology. Springer. pp. 54–. ISBN 978-3-319-54564-6. ^ Piomelli, Daniele; Russo, Ethan B. (2016-01-14). “The Cannabis sativa Versus Cannabis indica Debate: An Interview with Ethan Russo, MD”. Cannabis and Cannabinoid Research. 1 (1): 44–46. doi:10.1089/can.2015.29003.ebr. PMC 5576603. PMID 28861479. ^ Aizpurua-ppOlaizola, Oier; Omar, Jone; Navarro, Patricia; Olivares, Maitane; Etxebarria, Nestor; Usobiaga, Aresatz (2014-10-23). “Identification and quantification of cannabinoids in Cannabis sativa L. plants by high performance liquid chromatography-mass spectrometry”. Analytical and Bioanalytical Chemistry. 406 (29): 7549–7560. doi:10.1007/s00216-014-8177-x. ISSN 1618-2642. PMID 25338935. ^ Hazekamp, A.; Fischedick, J. T. (2012-07-01). “Cannabis – from cultivar to chemovar”. Drug Testing and Analysis. 4 (7–8): 660–667. doi:10.1002/dta.407. ISSN 1942-7611. PMID 22362625. ^ Mandolino, Giuseppe; Bagatta, Manuela; Carboni, Andrea; Ranalli, Paolo; Meijer, Etienne de (2003-03-01). “Qualitative and Quantitative Aspects of the Inheritance of Chemical Phenotype in Cannabis”. Journal of Industrial Hemp. 8 (2): 51–72. doi:10.1300/J237v08n02_04. ISSN 1537-7881. ^ Ethan B Russo; Virginia M Tyler (22 December 2015). Handbook of Psychotropic Herbs: A Scientific Analysis of Herbal Remedies for Psychiatric Conditions. Routledge. pp. 233–. ISBN 978-1-136-38607-7. ^ 2015. “Marijuana Chemicals Cannabinoids, Terpenes, Flavonoids (THC and CBD).” Howtogrowmarijuana.com. Retrieved from http://howtogrowmarijuana.com/cannabinoids-terpenes-flavonoids-cbd-thc/. ^ a b J.E. Joy; S. J. Watson, Jr.; J.A. Benson, Jr (1999). Marijuana and Medicine: Assessing The Science Base. Washington D.C: National Academy of Sciences Press. ISBN 978-0-585-05800-9. ^ Fischedick, Justin Thomas; Hazekamp, Arno; Erkelens, Tjalling; Choi, Young Hae; Verpoorte, Rob (December 2010). “Metabolic fingerprinting of Cannabis sativa L., cannabinoids and terpenoids for chemotaxonomic and drug standardization purposes”. Phytochemistry. 71 (17–18): 2058–2073. doi:10.1016/j.phytochem.2010.10.001. PMID 21040939. Retrieved 28 May 2015. ^ Bonini, Sara Anna. “Cannabis Sativa: A Comprehensive Ethnopharmacological Review of a Medicinal Plant with a Long History.” Shibboleth Authentication Request, ELSEVIER IRELAND LTD, Dec. 2017, apps.webofknowledge.com.proxy.cc.uic.edu/full_record.do?product=WOS&search_mode=GeneralSearch&qid=7&SID=5DN8tlmEqPYfoMJMbXL&page=1&doc=1. ^ Rajesh Arora (2010). Medicinal Plant Biotechnology. CABI. pp. 103–. ISBN 978-1-84593-692-1.